Ernest Appiah, known affectionately as the “Mayor of Carrboro,” will be graduating from CHS this year. Appiah’s nickname stems from his compassionate personality. When Appiah first started at CHS he was unable to speak. Appiah, who turned 21 this year, has aged out of his free public education and will start working at OE Enterprises this summer. OE is a supported work environment where Appiah will perform contracted work such as delivering mail and packaging soil kits. 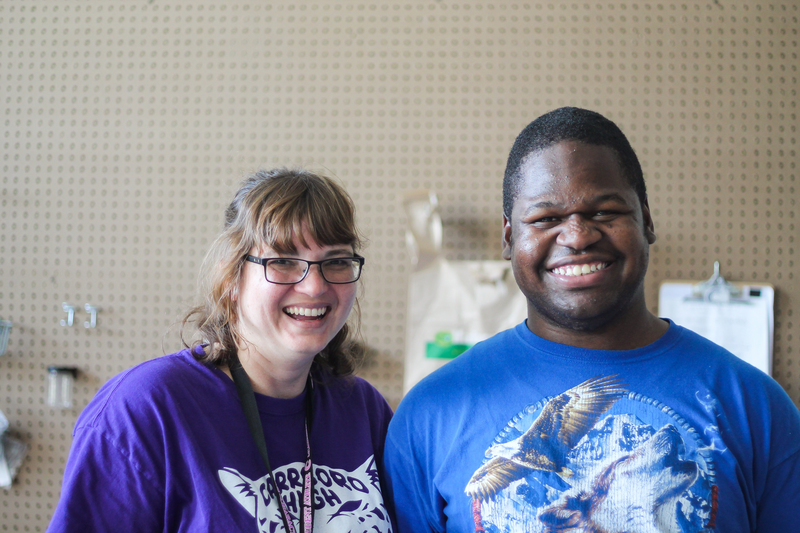 Barry and Appiah began their Carrboro careers on the same day six years ago. And, over the years, Barry and others have seen Appiah grow tremendously. Many CHS students share fond memories with Appiah. The hardest part of Appiah’s transition will be leaving his Carrboro family behind. Barry described her students as family. For the next month, in preparation for Appiah’s new job, Barry and her colleagues will be working with Appiah to make the transition as smooth as possible. “I do social stories with him so he can see what’s going to happen,” said Barry. On June 7, students and staff will hold a graduation party and ceremony for all students graduating from Ms.Barry’s class. Even though Appiah will be graduating, he will leave a lasting impression on faculty and students. 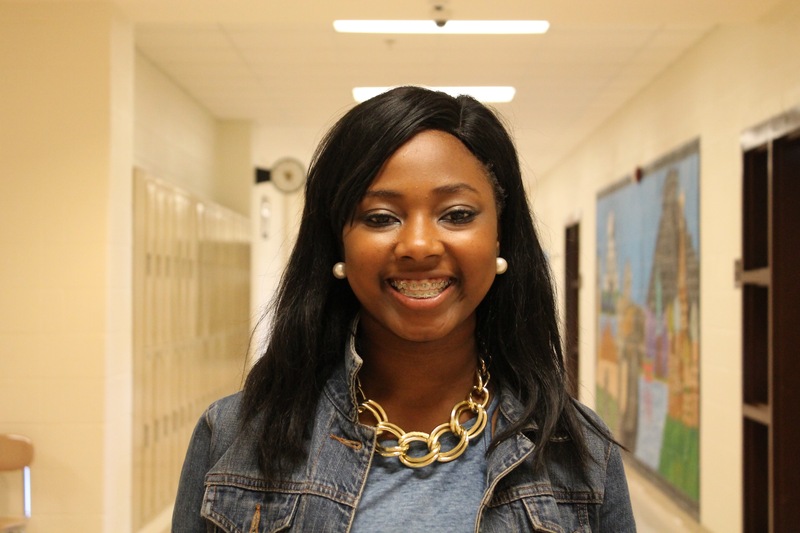 Carrboro’s first African-American Student Body President Niya Fearrington described her victory as “monumental.” She hopes her success will help others follow in her footsteps. “I hope that I’ve set a precedent for other minorities to become more involved in student affairs and even run for student government, because that diversity was very much lacking,” said Fearrington. Fearrington’s first priority next year will be making sure every student feels involved in the school. She plans on reducing language barriers by hiring students to translate student-government flyers. 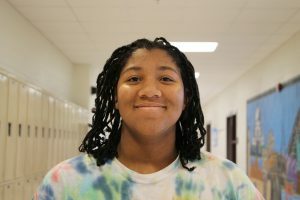 Fearrington appreciates student government for giving her an opportunity to become more involved in the Carrboro community, something she felt she lacked her freshman year before joining. 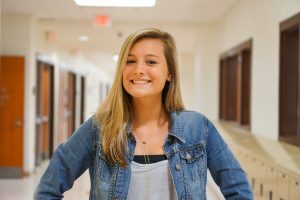 Mackenzie Cox, next year’s Vice President, is excited to be a part of a new phase of SGA. She has an optimistic message to students. “Be ready for student government. Be ready because it’s not going to be a student government you’ve seen before,” said Cox. Cox is ready to push for more SGA engagement with everyday students. She envisions a school where representatives regularly check in with students at their lunch tables and ask if there’s anything they need. It was an example of this friendliness that inspired Cox to join SGA. When she came to Carrboro, Cox didn’t know many of her freshman classmates. Encouragement from an SGA member quelled her nerves and inspired her to try to make others feel the same sense of welcome she did. Cameron Farrar explained that though she was happy to win her race for Treasurer, she felt more excited at the time about Fearrington’s presidential victory. “I think this is a really big turning point for Carrboro,” said Farrar. Farrar chose to become involved in SGA because of its voice. 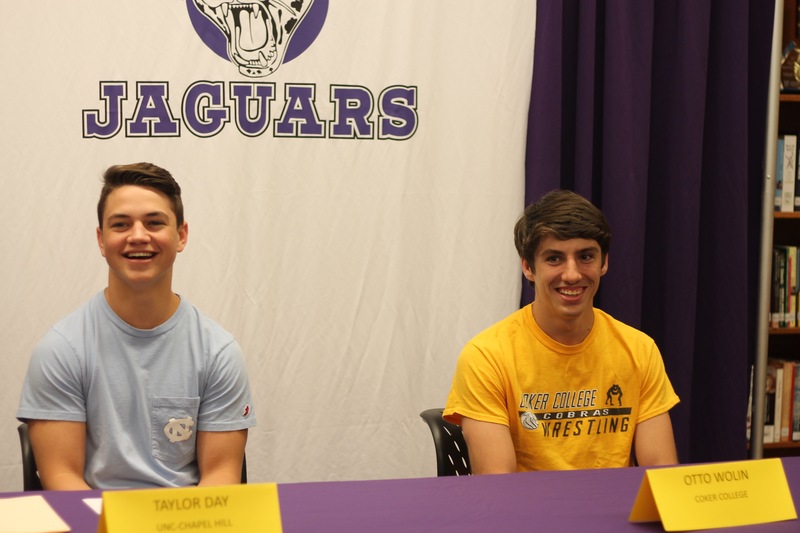 “When you bring together the class senators and the four elected officers you have a megaphone to tell students about what’s going on at Carrboro,” said Farrar. 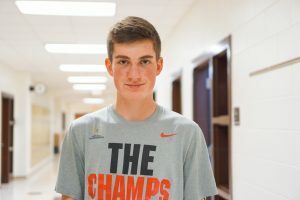 One way Farrar plans to use SGA’s influence is to fundraise in conjunction with the Junior Class Council in order to offset the cost of prom tickets. Currently a Junior Senator, next year will be Farrar’s second year in SGA. She wishes people knew that they don’t have to be in SGA all their life to run for an elected position. Tommy Holt, Carrboro’s 2017-18 Secretary, joined SGA because he had friends he looked up to in the program. He also recognizes the benefits SGA events bring to Carrboro and hopes to increase participation. “If you go to the events there are the same students at every one and you want different people to go,” said Holt. Holt’s message is that SGA should be a place where everyone feels included and welcome. “Student government is for everyone,” said Holt. one who works tirelessly for the school but is also really approachable. A successful season, and a heartbreaking postseason result. 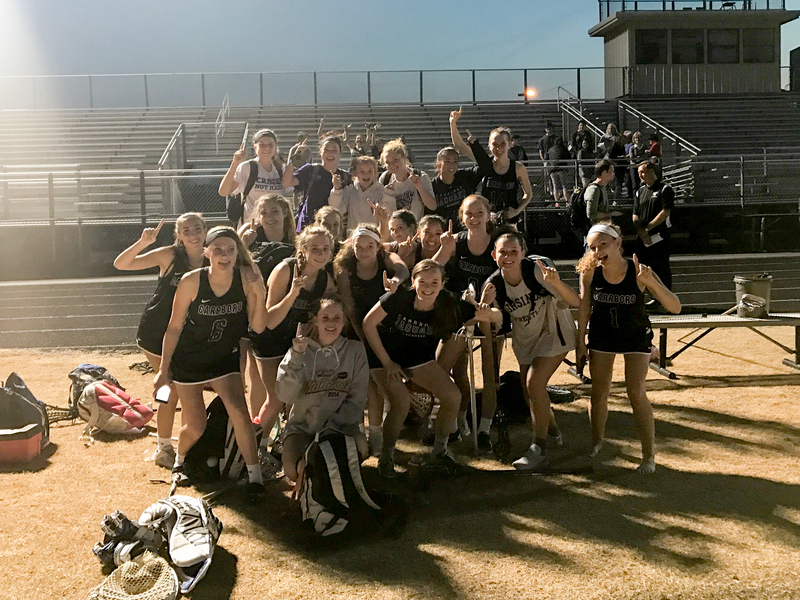 With a regular season win over rival East Chapel Hill, and an early postseason exit, that is the story of the CHS women’s lacrosse team this year. With plenty of senior talent, as well as up-and-coming underclassmen to fill in the gaps, this was a special year for Carrboro’s women’s lacrosse team. With an 8-4 record, and ranked 25th in the state by MaxPreps, the success Carrboro had this year is undeniable. However, thanks to post-season scheduling that pitted them against a tough team in the second round, the Jaguars made an early tournament exit in their second-round game against Weddington. Seniors Abby Seagroves, Sarah Seagroves, Katie Fesperman, Katy Strong, Issy Chung, Emine Arcasoy, Flora Devonport and Taylor Gosk are graduating, but the team still has great talent. Strong junior talents of Mackenzie Cox—who led the team with 46 goals this season—and Sydney Mosteller, who was second on the team with 43 ground balls, hope to propel the team to success in the future. 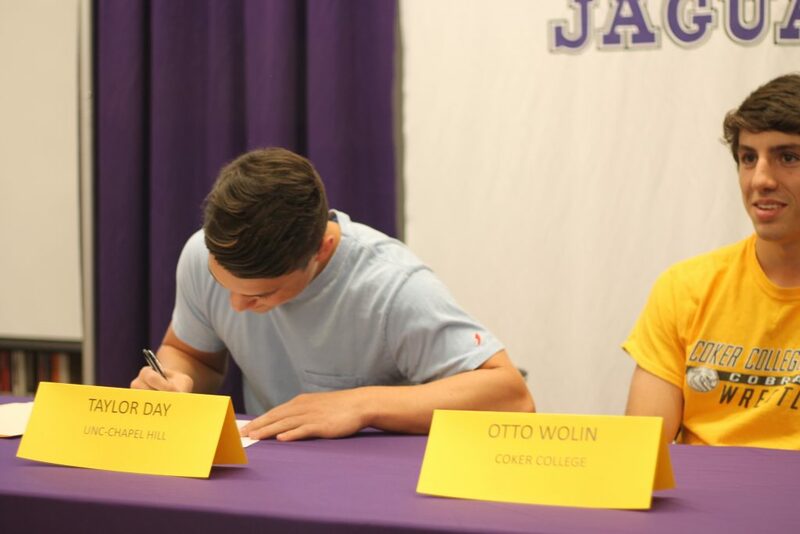 For the students of Carrboro High School, sports are a huge part of life. Whether they’re watching their local Tar Heels perform at the college level, or cheering on the various favorite professional teams of many students; CHS loves to watch sports. And in Chapel Hill, where sports are an integral piece of society, it comes as no surprise that Jaguars have favorite spots to watch their teams duke it out on the big stage. Pizza places are sport-viewing havens for many CHS sports fans. “I remember during March Madness some of the Landgate boys and I would watch the UNC games over at Old Chicago,” said senior Alex Hoffman. For many of the CHS students who wanted to cheer on their favorite college basketball team, however, they found refuge in somewhere other than a restaurant. The Dean Smith Center provided a venue with only one purpose: to support the Heels. On the night of the national championship game, many CHS faithful could be spotted there. “The atmosphere of the Dean Dome was really intense, really stressful and really great. Also, after the win in the national championship the walk to Franklin Street was really quick,” said sophomore Serhat Calikoglu. The “walk” is a UNC tradition, where all fans rush to Franklin Street in celebration of a National Championship win or win over rival Duke. Thousands stormed Franklin after the victory including CHS students. For the Duke fans at CHS, going to see the Blue Devils play live is an experience unlike any other. “I saw Duke play basketball at home last season, and it was an awesome experience to actually be there,” said Ben Lu. And of course, nothing beats watching a big game at your own home. “It’s just easier to watch games at home sometimes,” said sophomore Julia Sistachs. Regardless of location, it’s undeniable that the Jaguars love to go all out for their favorite sports teams.